Like like last May, the Galena Pack has come down out of the White Cloud Mountains in the vicinity of Stanley, ID. Lynne Stone sent the photos below, taken on Dec. 21. 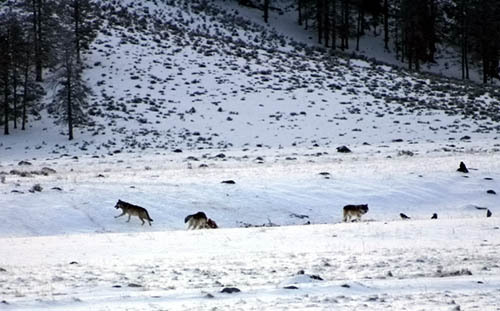 Some happy folks from Stanley were standing in the bad weather watching as well as some employees of the Sawtooth National Recreation Area as 3 members of the Galena Pack, probably including the alpha male, ate the elk they had brought down. Stone said the wildlife is abundunt if you can brave the cold. It is has been down to -30 F. Also scavenging the kill were ravens, of course, and a golden eagle, a bald eagle, and a wary coyote. Stone said, that if you would like more info on wolf watching on the SNRA, contact her at bwcc@wildwhiteclouds.org. There are two motels in Stanley and she suggests trying to stay at Jerry’s Store and Cabins in Lower Stanley because you might see wolves from your window. 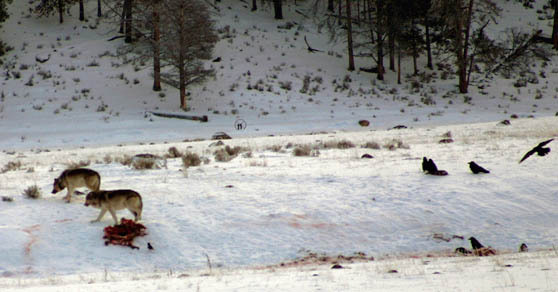 Two Galena Pack wolves (B277 with the collar, 18 months old, and a larger wolf, maybe the alpha male). And ravens flying in to wait. Copyright Lynne Stone. B277 takes a chunk of meat and leaves. 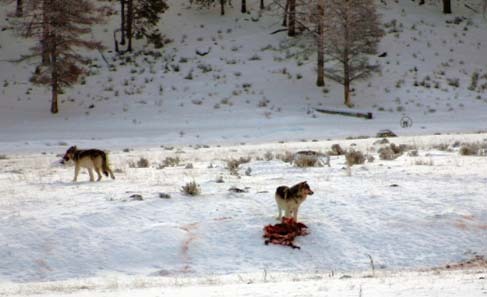 The larger wolf stands over the kill and eyes the waiting ravens. Copyright Lynne Stone. Thanks for the photos! !They are real nice!